Manchester City star David Silva is the focus of our Talent Scout post this week. This piece was published in May 2007. We wrote about the future Manchester City star way back in 2010, before he was one of the best in the world. 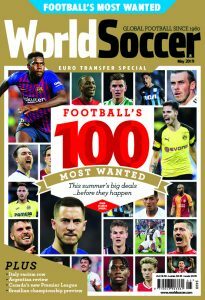 Published in the World Soccer Summer 2009 issue, our Talent Scout picked Eden Hazard to be a future star. See what we wrote about the Belgian big man in this Talent Scout post from October 2009. We picked the Barcelona man to become a star back in November 2007. Check out that piece here. The Tottenham playmaker was a Danish star in the making back in May 2010. Check out what we wrote here. The big man has played for some of the finest teams in Europe, and we wrote about him in our August 2013 issue. In our September 2011 issue we featured Draxler in our Talent Scout section. Check that out here. Aguero in his early career did not live up to the billing, but he has grown into one of the best strikers in the world.